We are supported by Mrs Teresa Calquhoun. We have PE on a Tuesday with District Sports. Please remember that the school gates will open at 8:45am and the register will be taken at 8:55am. The children can be picked up at 3.15. Home learning will be handed out on Fridays and needs to be returned for marking on Wednesdays. Please try to read with your child 3 times a week at home. We will endeavour to hear them read twice a week and change their book. In addition, there is a daily guided reading session where they might take part in fun reading activities in a group or read with the teacher. We would like to invite parents to stay for a reading skills half hour on Thursday morning between 9 and 9.30. Stay and listen to your child read, play a phonics game with them or read to a small group. These will start once the foundation children have settled in; keep an eye out for notices. We will be introducing a Mystery Reader session on Thursday afternoons but we will need your help. Once a week at 3 o’clock we would like to surprise the children with a visit from a familiar adult to read them your favourite story or to talk about your job or something special you have experienced or achieved. This isn’t restricted to parents; grandparents, older siblings, aunties and uncles can all be roped in too. We ask for your support in keeping the identity of the mystery reader a surprise, even from your own child! A sign up sheet will be in the office so that you can pick a date which will work for you. If you think you will need more time with the children please let us know. Please, please, please ensure that EVERY item your child brings into school is clearly labelled with their name. Items will inevitably become misplaced and it makes it a lot easier to return items to their owners when things are labelled. Thank you so much! Another busy month has flown by in Tavy Class. We received another letter from the Fairy Godmother who wasn't keen on the original ending of Jack and the Beanstalk. In fact, she had banned it! Our challenge was to write alternative endings for the story which would be fair for both Jack and the Giant. Tavy class proved themselves to be excellent mediators and we had endings full of compromise and sharing between Jack and the Giant. We made these into a book to display in our class exhibition at the end of term. We also learned to identify the different parts of plants and what plants need in order to grow big and strong. We used this knowledge to plant our own beanstalks and then wrote flip book recounts about planting a bean. In maths we have been continuing to work on place value as well as measuring using standard and non-standard measurements and exploring capacity. 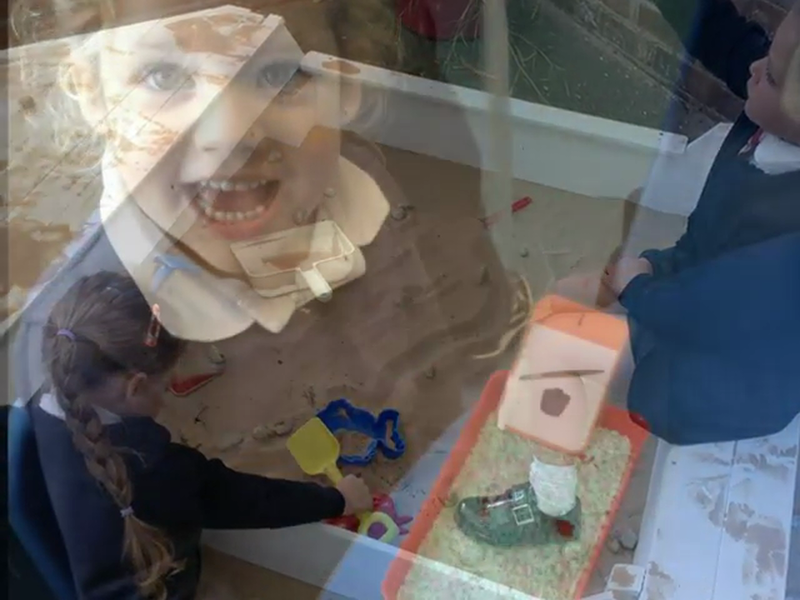 There has been lots of new vocabulary being used during our purposeful play which has been great to hear. The artists in Tavy class have also been painting picture of what they imagine the Fairy Godmother to look like and printing beanstalks using a range of different materials. I think we are ready for a little Easter Break now! February Fun in Tavy Class! 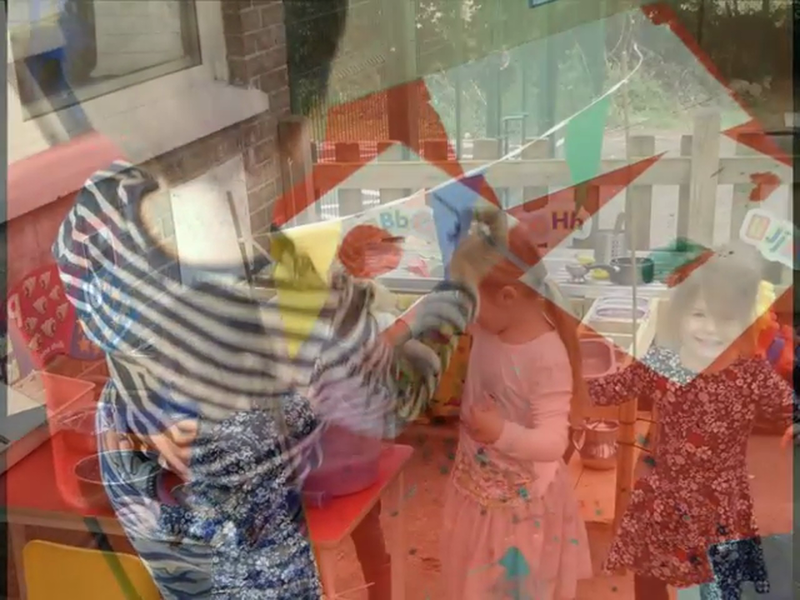 The fun all started earlier in the month when the children discovered some mystery objects. Much investigation ensued, Team Tavy weighed them, measured them and collected their ideas and questions on the discovery board. Then one day a box appeared... it was from the Fairy Godmother and it had a label; Magic Beans. We wondered if our mystery objects could be magic beans? The children chose to put them in the box, Adelaide said some magic words and we all kept a close eye on the box... nothing happened. Two days passed with no change but then, when we returned from half term a massive beanstalk had grown out of the box! Since then we have been having lots of fun exploring the traditional tale, Jack and the Beanstalk. We have explored the characters of Jack and the Giant, written describing words, written descriptive sentences and sequenced the story using time connectives. This month we had some new resources delivered thanks to Mrs Earnshaw and Miss Coombes. We now have construction bricks and trikes to use in our outdoor area. 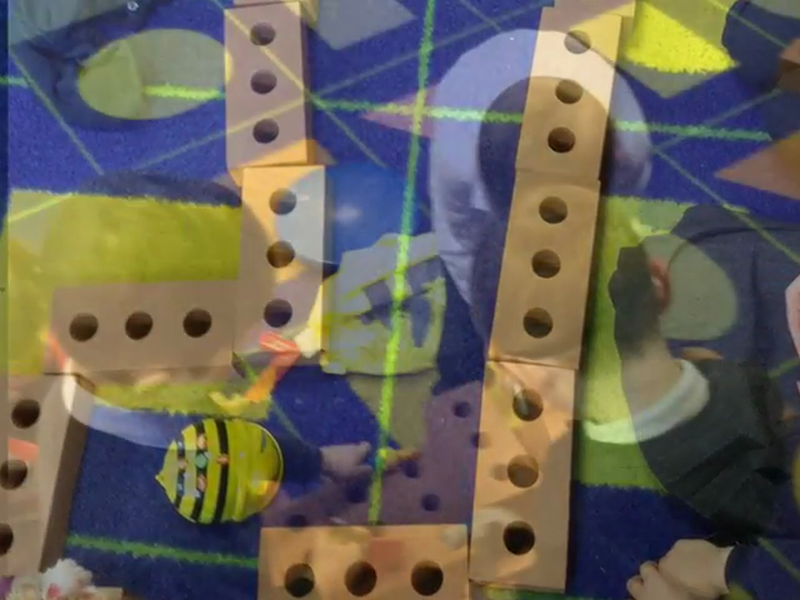 We have been using our bricks to demonstrate our understanding of positional language, build mazes for the Beebots and play cooperatively. The trikes have been enjoyed by everyone, we have even used them to sequence the story of Jack and the Beanstalk. We have also been ordering numbers, using positional language, building mazes, counting magic beans, using leaves to print beanstalks and making valentines love bugs. Team Tavy have also displayed our work on our school value LOVE during the Love Assembly and had an inspirational visit from Brian Pollard. We have many budding artists in Tavy Class! What have Team Tavy been up to in January? It has been an exciting start to 2019. 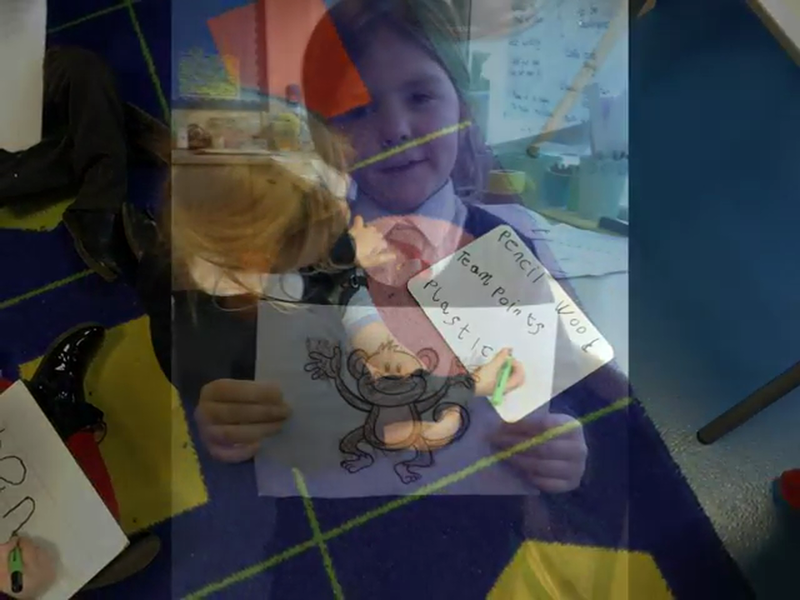 We began the term by exploring the land of The Ning Nang Nong but then a terrible crime occurred! Somebody had tiptoed into the Teachers' special room and eaten Mrs Daykin's porridge. Team Tavy were outraged! Who would do such a thing? There were clues; a red ribbon, some golden hair and a necklace with the letter g written on it. Could it be Gretel or could it be Goldilocks? Team Tavy were on a mission to find out. With the addition of CCTV footage sent to us by the police we were able to identify the notorious porridge thief, Goldilocks. Where could she be now? Team Tavy started to make a plan. All of the children and adults in Tavy are settling into their new routines and getting to know their new friends. We are focusing on working as a team to support and encourage each other in our classroom. We have been having so much fun, we have set up a Tiger Cafe, worked together to create tiger food in case a real tiger comes for tea and learned to play some new maths and phonics games. As part of our topic, All Creatures Great and Small, Team Tavy have been working on their best animal moves, singing animal songs in their song circle as well as finding out about animal habitats and naming and grouping animals. It has been a very busy start to the term! The Foundation children are busy learning their Phase 2 letters and sounds, counting and comparing numbers and developing their confidence in letter and number formation. Our Year 1 children have already written their own story books imitating The Tiger who came to tea! They have shown amazing perseverance and passion for writing. The children are shining in maths too, comparing numbers, counting beyond 20 and increasing their mathematical vocabulary. A very big thank you to everyone who has signed up for a Mystery Reader slot so far. We are looking forward to discovering who it will be this Thursday! Please remember to pop in for 20 minutes on Thursday morning to play some phonics games with your child. Please enjoy looking at some pictures of Team Tavy enjoying their learning both inside and outside of the classroom. Special visit by a Dental Nurse. 1 - Brush your teeth thoroughly twice a day especially before bedtime. 2 - Only eat a little sugary food at meal times. Are grapes healthy for your teeth? Thumbs up or down for this food? We were shown how to brush our teeth.